German Olympian Dimitrij Ovtcharov's serve isn't about power. It's about weirdness. 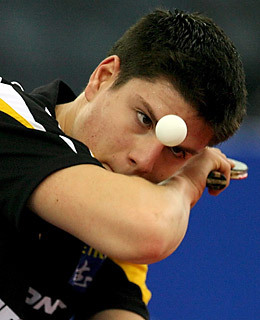 Crouching to table-level, he peers over his paddle and executes a hand dance before launching the ball at his opponent, who is probably too dumbfounded to respond. Which, of course, is the point. See pictures of the 2008 Olympics.